Screen capture of NBC video of protest demonstration, held Saturday, May 9. San Diego’s NBC affiliate continues to pave the way for local media in their coverage of the fatal police shooting of a man in the Midway area.Their coverage of the details and developing scandal around this shooting is the only news source tracking down witnesses and covering a small demonstration against the shooting held Saturday, May 9th. This was the incident where a man said initially to be holding a knife and was threatening a clerk at a Midway area adult store, but no knife was found. Plus the cop’s body-camera was either not turned on or failed to record anything. The police are investigating the shooting, have changed their policies on body cameras and have not released any of the surveillance vids of surrounding businesses. 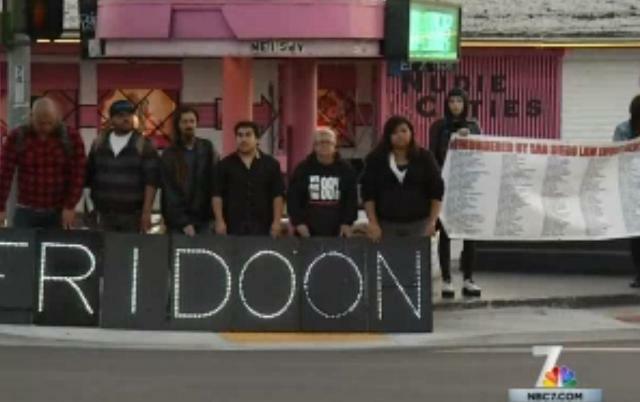 Meanwhile, a small group rallied at the site of the shooting Saturday evening, calling for transparency, for the police to release the videos and for justice for Fridoon Zalbeg Rawshannehad, 42, who was killed on April 30 by 27-year veteran Officer Neal Browder. The protesters used L.E.D. lights spelling out the Fridoon’s name.